Create a detailed written description of your client base, the number of years each client has been with your practice, and why each client selected you as his or her financial professional. Include demographic information, including the average age of clients, their location, and if multiple generations of the family are in the book. Create a profile of your staff, their roles, responsibilities, tenure, compensation, benefits, and other information. Be sure to include descriptions about the nature and depth of their interaction with clients. Create a breakdown of your business's revenue sources, including types and frequency of revenue generated, as well as products selected. Organize information about overhead expenses and net profits. Identify your business type—for example, a sole practitioner, corporation, or limited liability company—and niche. Also, identify partners, employees, and all others licensed to work with your clients. Obtain copies of any business plans, marketing materials, reports, audit letters, compliance manuals, and privacy policies. Update or write out a mission statement for the business. With proper organization, you can be better prepared to enter discussions and negotiations with a potential buyer. In turn, this helps you to efficiently valuate your business, transition it to your successor, and help set him or her up for long-term success. Take the time to evaluate and determine your business’s value. Carefully compare your business’s key statistics with similar businesses that have sold in the marketplace—as well as estimate the net income that your business will produce for the potential buyer. Alternatively, you may find it useful to hire a third party to value your practice for a fee. Keep in mind that your business’s value is a range, not a discreet number, and is determined by the prospective buyers. If you'd like more detailed information about the valuation process, be sure to download our in-depth guide. The buy-sell agreement will formalize the negotiated price, as well as the buyer’s terms. The agreement also includes conditions and duties for the roles that both the buyer and seller will play in the transition of the book. Be sure to consider the legal and tax implications when determining the details of your buy-sell agreement. If needed, consult a trusted attorney or tax specialist to ensure that all elements of the agreement are working toward your succession and retirement goals. Although some variables are out of your control, you can help your successor before, during, and after the transition. Be sure, for example, to communicate clearly with your clients about the transition. You may decide to announce the change and introduce your successor with a letter or an e-mail. You may also find it useful to set up meetings with specific clients and your successor to help ensure that their relationship starts off on the right foot. The methods you use and the degree to which you use them to manage the transition depend on your successor and your business. 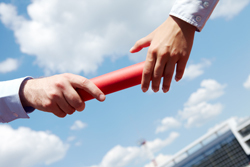 What are your major challenges when it comes to succession planning? Share your thoughts and some best practices below.